Hello friends! Hoping your year is off to a good start. The new year in our home has been…very busy! We have rid our house of 1/2 a ton of stuff (let me say that again…one-half of one ton!) I am a little scared that by saying that you will think that I have been , or should be, featured on ‘Hoarders'. I promise you, we are not really hoarders, but we have accumulated many things over the years. In addition to our ongoing Unclutter Your Nest and Lighten Your Load Boot Camp, Kate and I spent some time repainting and redecorating her room over the Christmas break. It was time to take her room from a tween room to a college student room. We up-cycled a bench, painted the walls in her room, painted her bed, painted and re-covered panels in her bulletin board, recovered the cushion for her window seat, created some art for her gallery wall and created a passel of pretty pillows. Holy cow…in retrospect we accomplished a great deal over the Christmas break. And, we accomplished the re-do on a budget…spending less than $200 for all the paint, spray paint, fabric and bench. Well done, us! Kate wanted ‘a bunch of pillows' for her room and for the most part we worked with pillow forms that we had in the attic or other parts of the house to DIY pillows for her room. Her newly recovered pink window seat cushion is finished with the addition of three pillow which stay in the gold and white theme. 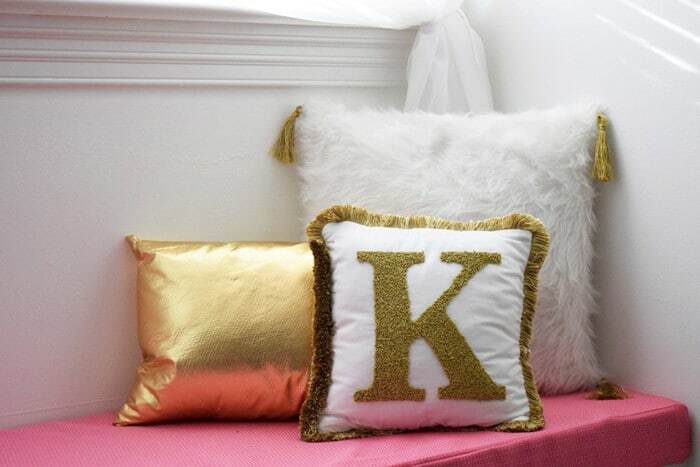 I made the ‘K' pillow several months ago and you can go here for instructions on how I made it. The gold was a fun, textured ‘pleather'-like fabric that we found at JoAnn's Fabric. We used leftover ‘fur' from her fuzzy bench to make the large pillows. 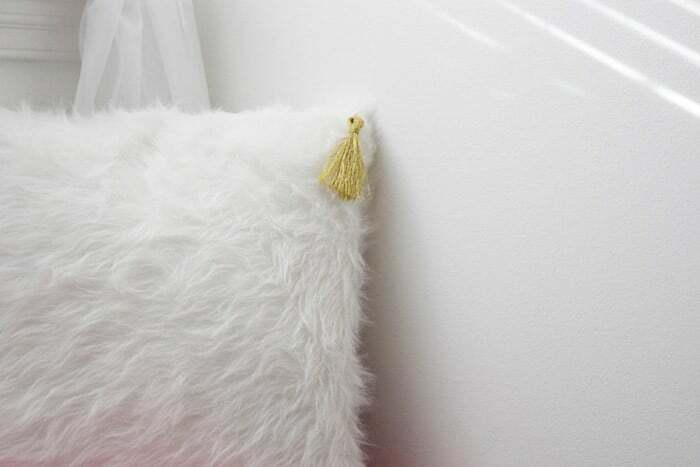 Kate made the tassels from gold DMC embroidery thread and we attached them to the corners of the big fuzzy pillow. It took 2 skeins to make the 4 tassels. Her bed features self-corded pillows made from the pink we used for the window seat, a large gold ‘pleather' pillow, the ‘fancy' & ‘shmancy' pillows and one more little furry pillow made from the last scrap of fake fur. When Kate was young, she had several fun sayings that we still use today. One of those sayings was ‘fancy shmancy'. She was so fond of tossing that out when something special caught her eye. At some point that saying popped into one of our minds and we decided we wanted to use it in our pillow population. 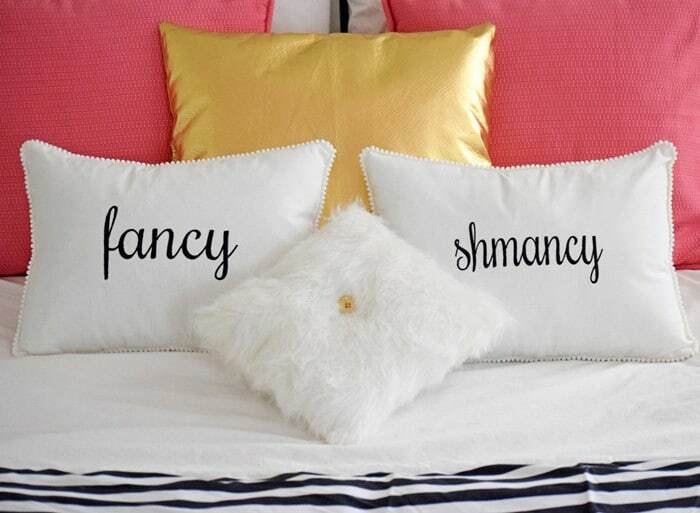 At first we thought of one pillow which said ‘fancy shmancy', but then we decided on splitting the phrase between two pillows. We made the pillow covers out of white Kona fabric edged with a tiny pom pom fringe that I already had in my stash. Then we took them to our favorite local monogram shop and had the phrase embroidered on the pillows. They turned out better than we hoped. With the last little wee bit of fuzz that was left over from the bench, we made one last little pillow. It needed a little something to break up all the white and I thought a gold button in the middle would be just perfect. While I had a bunch of buttons in my button bowl, I didn't have 2 gold ones of the same size. However I did have 2 white ones and gold spray paint and so, BAM…I had gold buttons. This diy pillows project was a good project for Kate and me while she was home for the month, except that she wasn't too happy to leave it to head back to her dorm room. But I'm glad she has a room she loves when she's home on break. And…we really did need to paint it anyway. I'll be back to share the rest of the changes we made to her room with you next week. Thanks again for stopping by today. I really appreciate your company and your comments. Your comments are the fuel that keeps me going. If you want to make sure you don’t miss future content, pop your email in the beige box up on the right or the greenish/bluish bar at the very top of the page. I usually send out 2-3 emails a week, so I won’t inundate your inbox. Those are adorable! That’s a great room. Thanks Nichole…loving the way the room is coming together. Thanks for stopping by today. Love these!! I wish I had the patience and the talent to do these DIY projects by mine always turn into epic fails. I bet they’d make a good what-not-to-do post. Hi Trish, You make me laugh! We all have our talents, I can sew pillows, but you run social media campaigns for all sorts! You are sweet to stop by today. Gold is my favorite color and it works perfectly here! This is beautiful! Hi Towanda, so glad you stopped by today and that you love my pillows. With your 3 girls, I’m guessing you are all ‘fancy shmancy’ all the time. Wishing you a very happy weekend with your girls. Thanks Stacey…do love ‘fancy shmancy’…makes me feel all happy inside and reminiscent of my funny little girl. Thanks for stopping by today and wishes for a good weekend. Oh Katrin, I can always count on your sweet words. And Kate and I did have a fun time making the pillows, and painting just about every surface in the room. Spray paint is to me what your metallic markers are to you! Can’t live without it. Hugs and wishes for a great weekend. I forgot to mention the fancy shmancy is sooo cute and really goes with the whole colour scheme! Love!!! Love. Love, Kate’s room and so love that you repurpose so many things!!!!! Thanks dear Nan! We had a good time working on it over break…almost done…just a few more things to do. You’ll appreciate that she wants a pink ram’s head for her wall…got to figure out how to make on out of paper mache. Any thoughts? Lynn, these pillows are fabulous! I love that saying haha. I also like how the old pillow ties in the gold on the benches. Awesome work! Hi sweet Erica, thanks for stopping by to visit. We’re pretty tickled with how the pillows turned out, especially fancy shmancy. I love that Kate loves them. That’s all that matters in the end. 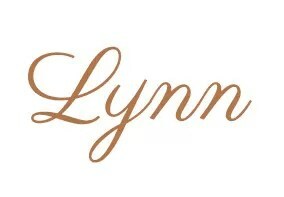 Wow, Lynn you sure have been busy this past month, between the uncluttering and Kate’s room. I really love all of the pillows and they look just perfect in her glam room. I’m looking forward to your reveal for the rest of the room. It is just adorable. And I know how ard it can be to transform a tween room into an older girls. I’ve got two myself who are a few years younger than yours, and boy are they opinionated! We have been super duper busy…but also very productive. Kate has, like I’m sure your girl do, very specific opinions. I found some beautiful fabric that would’ve looked fantastic with everything she chose, but she could not be persuaded. Oh well…I have to admit that I like the way it looks. Hugs and kisses and wishes for a good weekend. Thanks Mandi…Kate and I are pretty tickled with them as well. It’s a nice change and who doesn’t love to have a change in their room decor! Thanks for stopping by today and wishing you a great weekend. I love your pillows! the “K” one the other day was amazing but I love the fluffy ones, I used to have fluffy ones but i’ve never tried making them myself! Love your pillows Lynn, they are all very pretty! 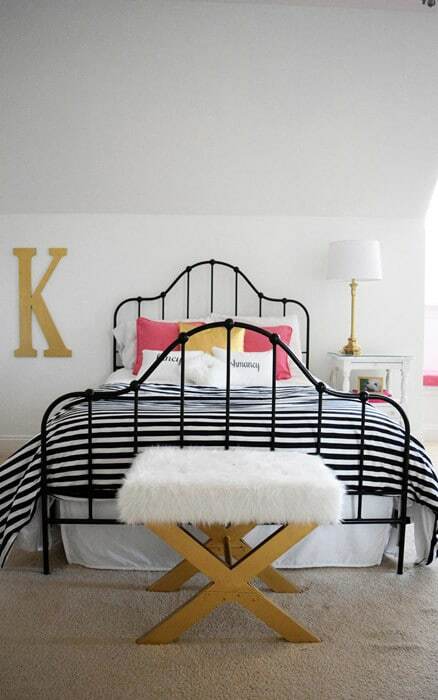 Love your color scheme with the pink, gold and white. Love the fuzzy bench too. I love the big K, and the pillows. My girls are still very young, but I can already tell that they are going to have some opinions about their style as they get older. Hi Jessica, you’ll have so much decorating with your girls. In my house, my daughter has very strong opinions about her room, while my son truly couldn’t care less…classic boy/girl. Thanks for stopping by. Wishing you a happy Tuesday. Nicely done with your uncluttering!! 🙂 That’s amazing! Also, your daughter’s room has turned out just fabulous! You really did get a lot of things done over Christmas break. I really love your button bowl and am tempted to put my buttons in a bowl now. What a cute storage idea! And nicely done with the spray paint. You have a way with projects! 🙂 It’s very impressive. Hi sweet Gina…all your kind words make me smile…you’re good for my soul. We are pleased with how it turned out, but we worked our tushes off to get it all done while she was home. There are a few more items on her ‘room wish list’…will get to those soon. Hi Lori…thanks for stopping by. You just can’t say ‘fancy shmancy’ with a sad face…can you? I’m tickled with how they all turned out…but more importantly, so is Kate. Spray paint has got to be one of the greatest creations! It’s a bit of joke with my family…stand still too long and you’ll get a good coat of spray paint. I should do a round up of all the things that I spray painted in that room. Great idea! I love these! This room is absolutely gorgeous. Modern and chic. Love it. Hi Sweet Lindsey…thanks…Kate loves it, so I’m happy. I’ll share before and after photos soon, it made a big difference. Thanks for stopping by. 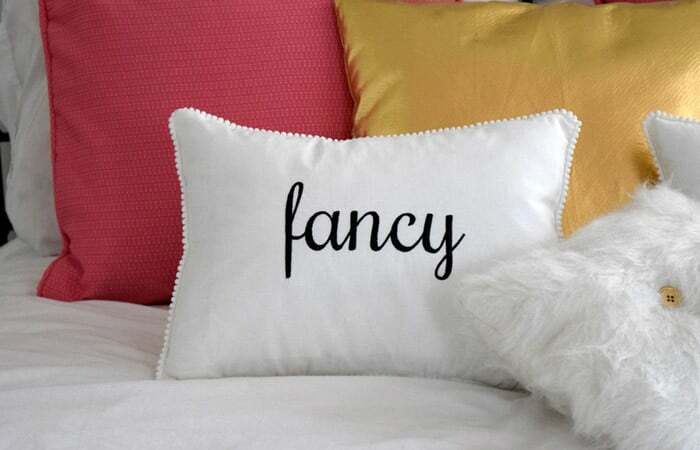 Your awesome pillows are Fancy Smancy! Love them so much. Thanks so much for sharing your creativity at the The DIY Collective this week! Please come back next week to show off your latest project! Hi Ashley…I’ll be back for sure. Thanks for stopping by and your kind words about Fancy Shmancy…they make me smile. Love the pillows! Found you on WayWow link party! Would love it if you would come over and share this or any other post with us at Brag About It. It’s a Tuesday link party I co-host that starts Mondays at Midnight. Hope to see you there! Hi Laurie…i’d love to come visit! Thanks for the invite. See you Tuesday! Hi Mattie…yup, it’s my new favorite room as well…just so fun to go look at it. But we still have a few more fun things to do…when I find a couple extra hours in my day. thanks for visiting today. Wishing you a lovely evening. Lynn, I love this room, you and your daughter make a great combo/team, it’s so pretty. Do you think she’d mind if I used it while she was away at college? It looks like a lovely hotel room, I could just snuggle in and be cozy! It’s all gorgeous, and I love the pillows! Fancy Shmancy indeed! Hi Nikki, I won’t tell if you won’t! Still working on a few more projects to finish her room. It’s been fun. But now that she’s away, it’s not as fun to do it on my own. I’ll get it done before she comes home for spring break.